The Massachusetts Convention Center Authority hosts a series of neighborhood exhibitions which celebrate the work of artists across Boston’s varied cityscapes, one neighborhood at a time. The Boston Convention & Exhibition Center (BCEC) is excited to present "Full Spectrum" featuring artists who work just down the street in Fort Point. Join the BCEC for the opening reception this Monday, April 22, 2019 from 6 pm to 8 pm at 415 Summer Street. 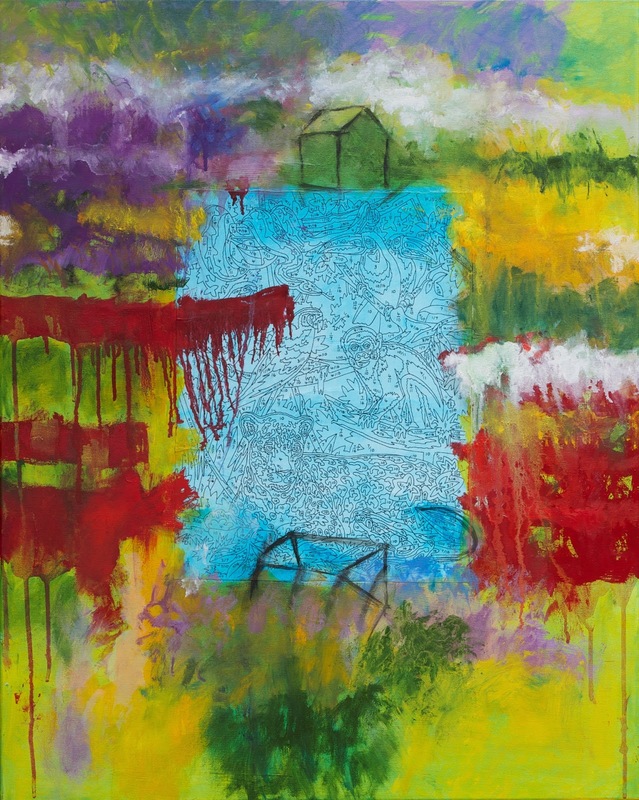 Participating Artists: Dirk Ahlgrim, Jamie Calderwood, Becky Dwyer, Jennie Griffith, Joanne Kaliontzis, Christina Lanzl, Helen Lee, Stephen McMillan, Kevin O'Brien, Brian Sage, José Santos, Darcy Schultz, Casey Stanberry, Mark Stock and Christine Vaillancourt. Fort Point is home to a multitude of historic warehouse buildings, artist studios, arts spaces, and galleries that have contributed to this thriving neighborhood for years. 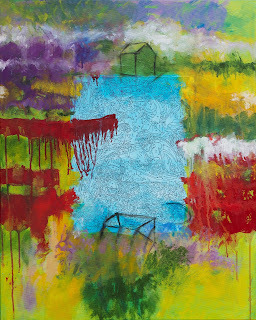 The artists in this exhibition do not shy away from color or scale, providing a full spectrum of vibrant imagery and textures that the viewer can engage with, both from afar and up close. The show runs through August 18, 2019. Special thanks to Capital One Cafe for hosting and providing treats. Walk, Strut and Dance is a one-of-a-kind runway show and fashion experience presented in collaboration with Lasell College and the Fort Point Theatre Channel. The runway show will celebrate sophisticated, unconventional, and innovative designs as models walk, strut and dance their way down the runway. Meet the artists at the Designers Fashion Showcase with clothing and accessories available for purchase from 6:00 pm to 7:00 pm and again after the finale of the runway show. The runway show begins at 7:00 pm. Dawna Davis is proud to commemorate her fourth year of collaboration with established designers, emerging designers and Lasell College students working in the fields of art, design and production with Walk Strut and Dance. Walk, Strut and Dance reveals unique creative styles and designs for both men and women by: Linda Avila, Timna Barsheshet, Eunice Bruno, Teresa Coates, Dawna Davis, Cailin Flannery, Lloyd Hall, Panna Kiss, Marianna Lenskiy, Alexa Monfette, Elizabeth Nguyen, Adam Pajkowski, Caitlin Reddington, Azi Sharif, Souther, Ammy Thach and Lindsey Williams.The runway show is produced by Meghan Borges. About the curator: Dawna Davis is a wire artist living and working in the historic district of Fort Point in Boston, Massachusetts. She creates sculptural wire attire, accessories, wall art, and home décor creations that reflect her love of light, color and whimsy. Davis’ previous runway shows include OUTLOUD (2017), The Art of Adornment (2016) and Simply Woven (2015). Proposed Work: At front canopy, install signage. Proposed Work: At business entrance, install canopy and signage. Install patio area pavers, planters, lighting, and dining furniture. ► Applicants whose projects are listed under this heading NEED NOT APPEAR at the hearing. Following the hearing, you will be issued a Determination Sheet to present at the Inspectional Services Department (1010 Massachusetts Avenue) as proof of project approval when applying for permits. ISD personnel will send an electronic copy of your building-permit application to the commission staff for review. (To avoid potential confusion, the text of your building-permit application should be consistent with the project description given below.) Commission staff will accordingly authorize the execution of the work, attaching any applicable provisos, reflecting the relevant guidelines and precedents.► PLEASE NOTE THAT FOLLOWING ISSUANCE OF THE DETERMINATION SHEET NO FURTHER CORRESPONDENCE WILL BE ISSUED FOR THE APPLICATIONS LISTED BELOW. The electronic building-permit application as annotated by commission staff will constitute your Certificate of Appropriateness; this will be valid for one year from the date of the hearing. The applicant is required to notify the commission of any project changes; failure to do so may affect the status of the approval. If you have any questions not addressed by the above information, please contact staff at 617.635.3850 or FortPointLDC@boston.gov. Thank you. APP # 19.943 FPC 345 A Street: At street level facing A Street, install small concrete pad over the existing gravel area. A strong foundation is important in many instances. Over the winter, strong foundations were built for Martin's Park play attractions: climber, swing, and amphitheater. In addition, sidewalks and seating began to spring up. Check out what else is in store this spring. 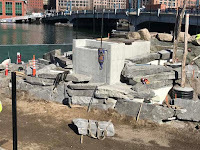 - Stonework has continued including significant progress on the tailing walls of the bridge. - Sub grade work for sidewalks. 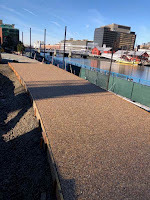 - Several panels of exposed aggregate walks have been poured. - Water garden seating completed. - Fence post installation is complete. - Mud slab poured around Cosmo climber. - Sub grade work completed for sidewalks. - Form work for slab under dish swing and log climber formed. - Concrete slab in front of amphitheater poured. - Shade structure posts were installed. 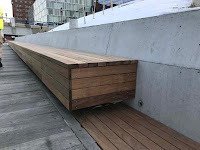 - Wooden Harborwalk seating completed. - Planting soil installation started. - Completion of tailing walls for the bridge abutments. - Mud slab for swing and log climber to be poured. - Completion of soil installation. Updated 4.3.19: Extended comment deadline 4/12, new IAG meeting 4/10 and 4/2 BCDC design meeting presentation (details below). Pembroke, an international real estate business associated with Fidelity Investments, is proposing to revitalize Commonwealth Pier known for over three decades as the Seaport World Trade Center (SWTC). 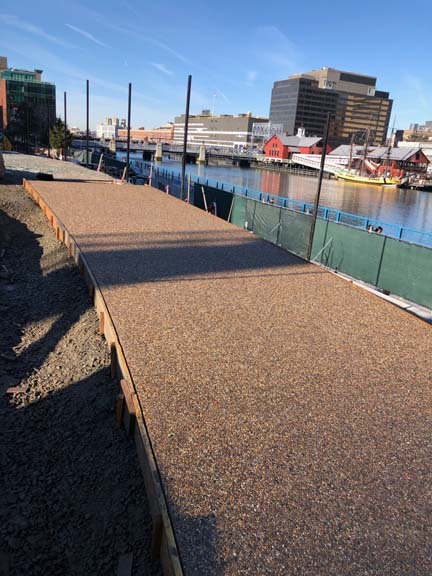 Pembroke introduced the Commonwealth Pier Revitalization Project first at FPNA's Fort Point Seaport Neighborhood Meeting on February 26, 2019. The proposed revitalization of SWTC will modernize and re-position the existing historic building and Pier for expanded use as a place for work, retail, events and active public waterfront experiences within the city's Seaport District. The project will enhance its current uses by replacing the existing exhibition hall with new public realm spaces and improvements and expanded ground-floor retail space, as well as creating new flexible and innovative office space and first-class event spaces. Fidelity Investments will occupy the office space. Commonwealth Pier is owned by Massport and situated within a designated port area (DPA). 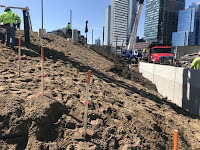 The project will undergo the City's Boston Planning & Development Agency (BPDA) Article 80 Large Project Review as well as the MassDEP Waterway Act Chapter 91 licensing process. View Commonwealth Pier Revitalization Project Notification & Environmental Notification Form. The document combines the BPDA's Article 80 project notification and Massachusetts Environmental Policy Act (MEPA) environmental notification. 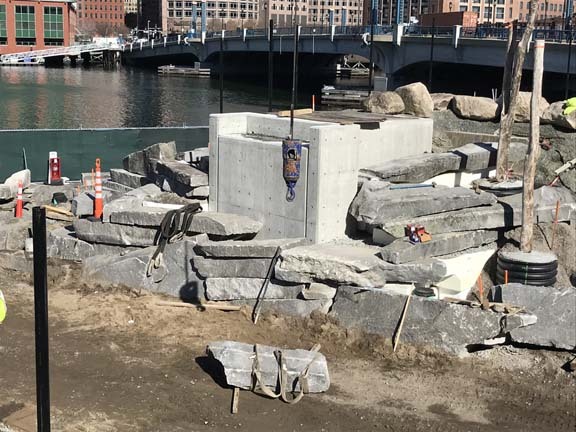 In addition to MEPA's environmental review, there is also a Waterfront Development Plan required as part of Massport's Memorandum of Understanding with Department of Environmental Protection (DEP). 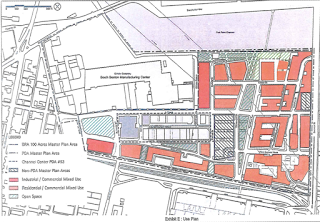 The preliminary Commonwealth Pier Waterfront Development Plan can be found here. 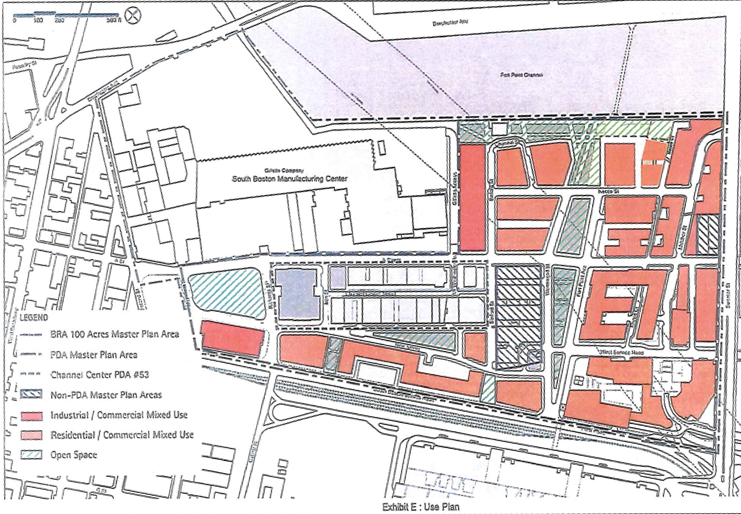 The Waterfront Development Plan is a precursor to the proponent's Chapter 91 application. What is Chapter 91? Check out the People's Guide to the Public Waterway Act (Chapter 91) created by CLF. Street cleaning starts tomorrow from 9 am until 1 pm on Binford Street and on A Street. The cleaning of Binford Street covers A Street to the Channel. The odd side of the street (closest to Gillette) will be cleaned on the first and third Tuesdays of the month starting April 2, 2019. The even side (next to the Channelside parking lot) will be cleaned on the second and fourth Tuesdays of the month starting April 9th. The street sweepers will also tackle A Street from Binford to Congress on the 1st & 3d Tuesdays beginning April 2, 2019. They will cross over to even side of A Street from Melcher to Congress every 2nd & 4th Tuesday commencing April 9th. 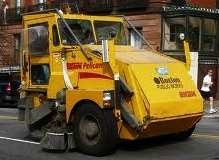 Everyday street cleaning occurs on Congress St (Dorchester Ave to E. Service Rd ) and Sleeper St from 12:01 until 7:00 am. Street cleaning occurs April through November. To receive no tow reminders,click here and enter the street name and then scroll down. Lookup nearby street sweeping schedules here.